Based on the hit Nickelodeon show Victorious!, Tori (played by teen star Victoria Justice) tries to win the starring role in the school play against rival Jade. 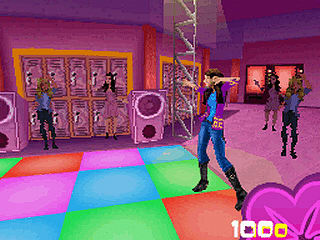 As Tori, you'll get to interact with all the Hollywood Arts crew including Beck, Cat and more, in the show's top locations like the Hollywood Arts School and Gorilla Club. 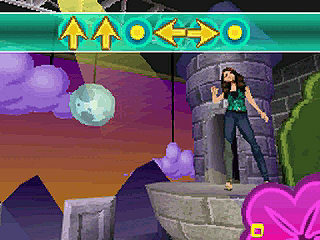 Victorious: Taking the Lead offers players a chance to explore Hollywood Arts and play 20 performance competitions for the Nintendo DS, featuring hit songs from the show! 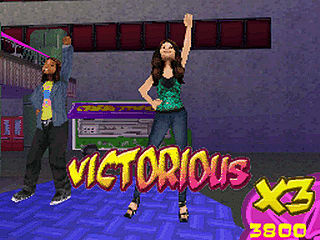 An Authentic Victorious Experience - Victorious: Taking the Lead features a brand new storyline based on the popular series and stars the voice of teen sensation Victoria Justice as well as the rest of the show's original cast, and features hit songs from the show, such as the brand new "Take a Hint". Become Tori Vega - Fans will be able to play as Tori Vega as she tries to win the starring role in an upcoming school play by completing a variety of fun mini-games and tasks. But watch out: school rival Jade is after the same part! Interact with Tori's Friends and Change Your Fate - The game offers multiple conversation options for Wii that allow fans to tailor how they want to interact with characters from the show. These choices can affect the outcomes of the game's plot. Explore The World of Victorious - Visit well-known locations from the series, including Tori's school, Hollywood Arts High School, zany acting teacher Mr. Sikowitz's Improv Classroom, Hollywood Arts High's Black Box Theatre, and local teen hangout, The Karaoke Dokie.